iTunes installer includes iTunes update installer files, iOS update installer files, iTunes installer cache and iOS update installer cache. Don’t underestimate iTunes installer files or iOS install files! Generally, each iTunes installer is more than 200MB and each iOS update files is more than 1.2GB. Besides, when installing the updates, it generates cache as well. All those files are left on your computer after updating. When this happens, your iTunes will become sluggish and slow to run. However, that’s not the only effect of iTunes installer files; they can clog your PC’s operating system thereby making your computer to run slowly and sluggishly too when using other software or running a program. Nevertheless, there is a good news for you: iTunes installer files and cache are cleanable, and it can be done without costs. Finding and cleaning iTunes installer files is not so easy. Instead, you can take advantages of iMyFone TunesFix. As its name shows, tune up your iTunes. It’s the world’s 1st all-in-one solution to clean iTunes and fix iTunes errors and issues. Applied with the cutting-edge technologies and services, it promises to keep your iTunes clean, secure and fast just in one click. Remove all the iTunes/iOS install files and cache in one place. Clean all the useless files from iTunes, including old backups (including those left behind by third-party software), logs, cookies, and other junk. 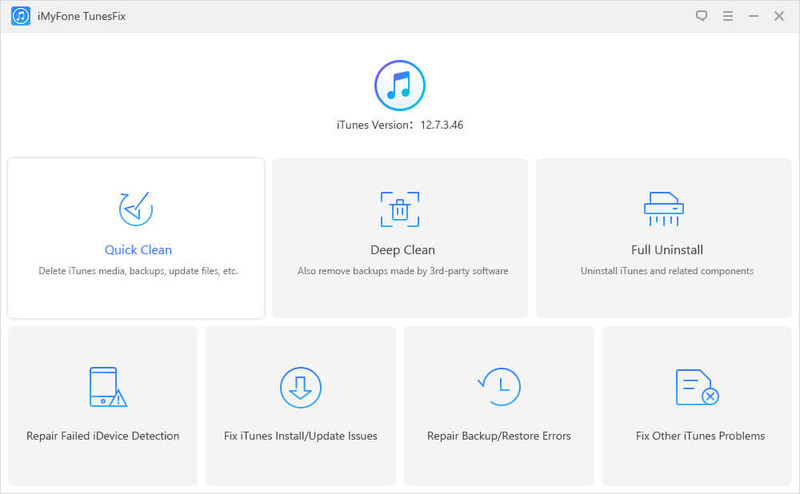 Fix all the iTunes errors and problems, like iTunes connect issues, backup/restore errors, install/update failed, etc. Completely uninstall iTunes and related software components without leftover, ensuring your privacy is secure. Step 1: Launch TunesFix and it will automatically detect your iTunes. If your iTunes does not have any issues, then the Home interface of TunesRescue will open, if not, iTunes repair will be conducted first before the Home interface is opened to you. Step 2: Select “Quick Clean” and click “Scan”, it will scan everything related to iTunes. Note: If you want to delete backups left by third-party program, choose “Deep Clean”. 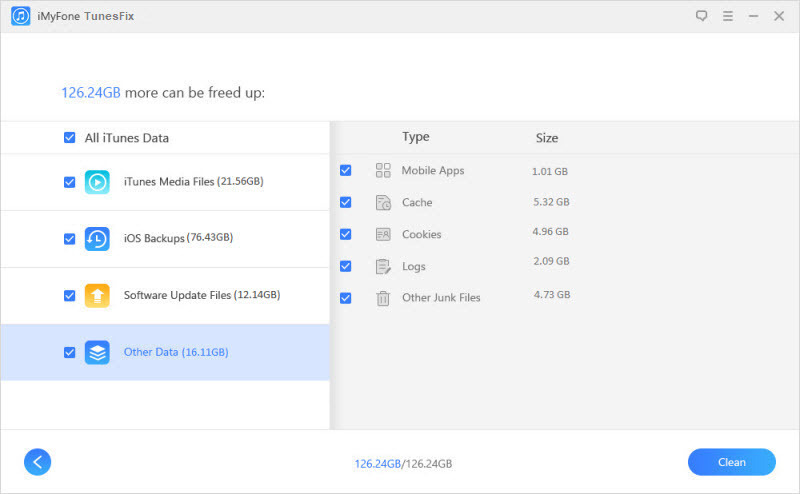 Step 3: Check “Software Update Files” and “Cache” in the “Other Data” category, then click “Clean” to let it done. 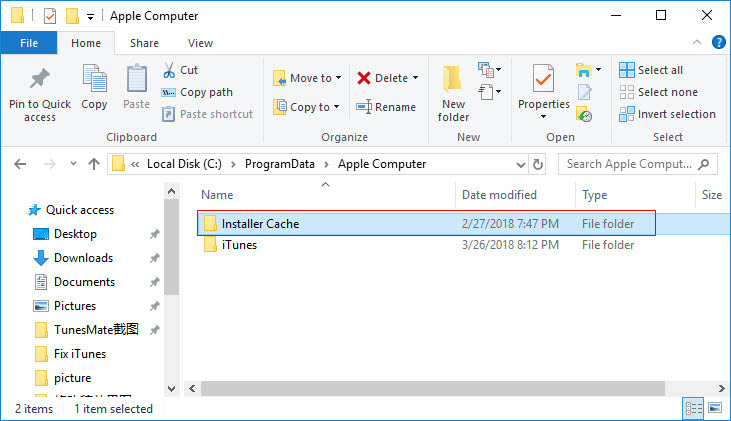 Please note that the iTunes install files, iOS update installer files, iTunes installer cache and iOS update installer cache are in different directory on your computer. To manually clean them, you need to be patient to find them out by yourself first. The directories may be different on different computers. What we can tell you is the possible directories, you need to get there and figure it out. In general, you can access those directories above to clean the installer files and cache. But if your iTunes is not in the default settings, they would be stored in other places. It takes much time to find the directories for each kind of installer files and cache. It’s hard to find all the files and cache, because some are stored in other unknown places. You need to figure out which are unwanted files and which are important data. Accidentally deleting important files will make your iTunes run wrong.